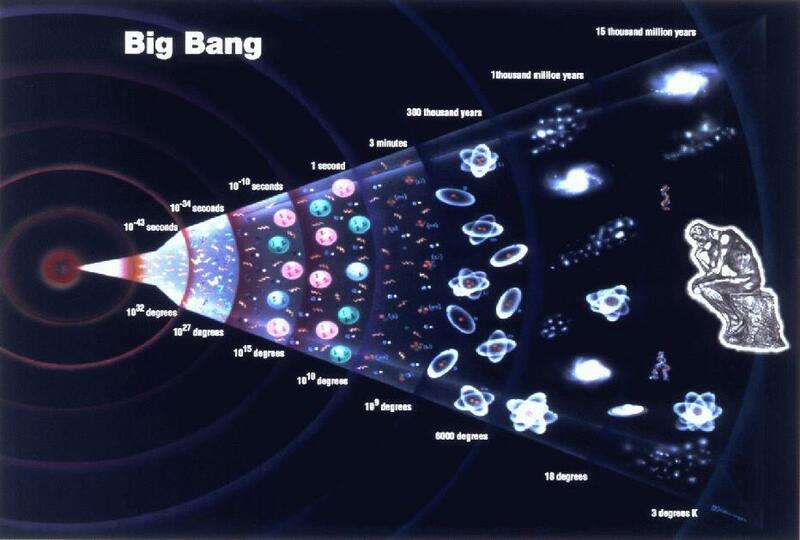 Today we’ll look at more supposed proofs of the veracity of the assertions of cosmological scientists regarding the Big Bang, and Black Holes, and other phenomenon beyond the realm of our solar system which are described in the current literature. Particular emphasis will be given to the known qualities of light. Please, please understand that I am not attacking the reputation of any cosmological scientist, nor am I suggesting any conspiracy among them. Instead, I’m inviting you, the reader, as well as our current crop of cosmological scientists, to look at the subject matter of cosmology in a different way. Let’s examine why the quoted description of this photograph cannot possibly be accurate. 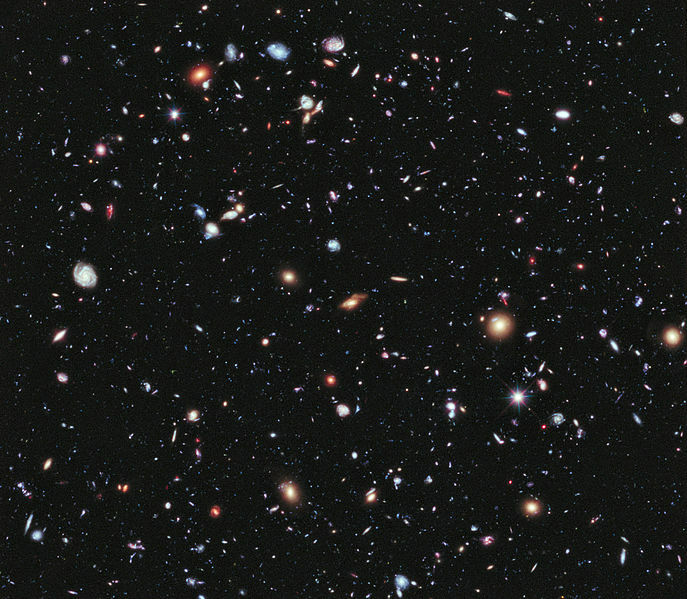 The tendency of light to diffuse, or to spread out due to a non-flat source of origin, as it travels through any distance, should be enough to prove the fiction of this analysis of the Hubble photo. When we turn on a light bulb in a room of our house at night, the intensity of the light is always greatest at the source, the center of the light bulb. The intensity of the light diminishes as the glow from the source spreads out across the room. The light from the rounded light bulb source is dispersed over a larger area of space within the room, and so cannot illuminate the distant corners of the room as well as it does the areas closest around the light bulb, due to the rounded dispersal of the quanta of light being emitted. This process is called diffusion. Let’s now look at a special case of light, the laser. The core property of laser beams is that their emitted light remains tightly focused in a straight line over large distances. In a laser, light is amplified using mirrors until it departs from the source in a “straight line.” This straight line is generated by the amplified light reflecting off of the generally flat surface of the mirror. Since light travels in straight lines unless reflected or refracted, this amplified light reflecting off a flat surface allows a tight concentration of light, with all the individual quanta of light traveling in almost exactly the same direction. The directional beam of light generates a very powerful and useful concentration of the energy of light onto a very small receiving surface. Nevertheless, the reflective mirror of the laser is not an absolutely flat surface, only a relatively flat surface. There is no technology which will create a reflective surface which is absolutely flat at the atomic level. Thus the laser concentrates straight lines of light over short distances to a target, usually a matter of inches or a few feet. Let’s also assume for the sake of argument that there are some lasers which can adequately concentrate light over a distance of five hundred or a thousand miles. Lasers use collimated light. This is light whose rays are parallel, and therefore will spread minimally as it propagates. The word is related to “collinear” and implies light that does not disperse with distance (ideally), or that will disperse minimally (in reality). A perfectly collimated beam, with no divergence, cannot be created. The light waves will eventually disperse away from the center of the diameter of the beam over a long distance, due to the lack of flatness of the generating surface and due to the diffusion of the energy of the light wave over space and time. Let us then compare the light dispersion of this laser over 384,403 km (238,857 miles), the distance from the earth to the moon, with what we see in the above photograph of a telescopic image. The scientific interpreters of the image say that they can see discrete objects in the picture, such as galaxies, which are as old as 13.2 billion years. This stated age actually means that the light in the picture has traveled 13.2 billion light years to reach the optical mirror of our Earth telescope, since light travels over any distance at the speed of light. Since light tends to move in a straight line, the only way all that light from the galaxy could reach into a telescope on Earth will be if the distant galaxy were absolutely flat and the flat surface was absolutely aimed at the absolutely minuscule speck in the universe known as Earth. Way too many absolutes are required to line up for us to actually be able to see this so-called galaxy far, far away. A light-year is a unit of length equal to just under 10 trillion kilometers (or about 6 trillion miles). So if what the scientists say is true, the light in the telescope’s picture has traveled 6 trillion times 13.2 billion miles to reach the optical mirror of the telescope here on earth. That works out to the object in the photograph being 79,200,000,000,000,000,000,000 miles away from the telescope which is photographing the so-called galaxy. (That’s 79.2 sextillion miles, by the way.) This means that if the picture is actually from the described “galaxy” then the light from the galaxy must have traveled in an absolutely straight line with no dispersion, for the described distance, in order for us to be able to see it exactly as it was way back then 13.2 billion light years ago. Could this be magical thinking? Now if light from a laser disperses from a half-inch beam into a light beam twenty kilometers in diameter over the relatively short distance of 384,000 kilometers, how much more will light from a star or galaxy disperse over a distance of 13.2 billion light years? And this dispersion remains constant only if there are no physical objects or dense fields (such as a Black Hole) or cosmic dust on the path the light takes from origin to destination. 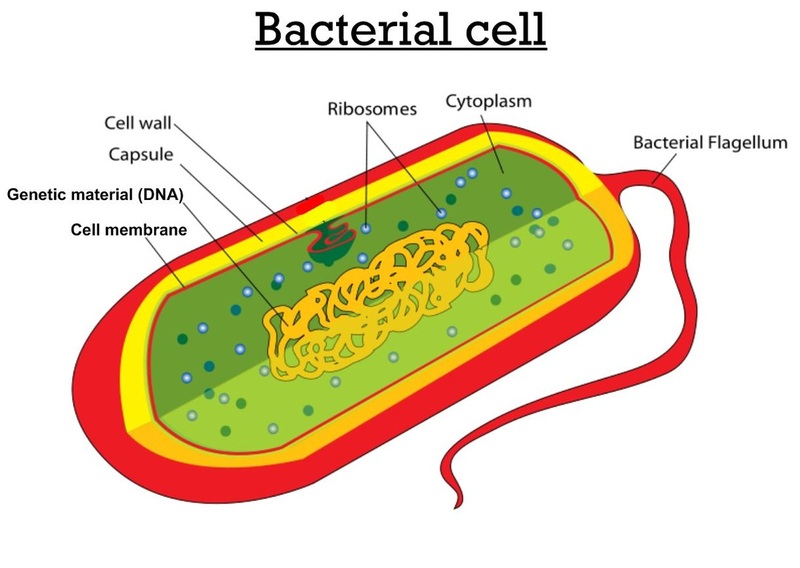 Such physical objects or dense fields will cause any light to bounce, or waver, or diffuse or to take some other different track than a straight line. So, to say that a specific dot of light in our above telescopic image shows the actual appearance of an object which is 13.2 billion light years away (or even a paltry million light years away) is pure poppycock. Dispersion and diffusion, not to mention bouncing and wavering, will have rendered the light emitted by such a theoretically distant object to be no more than a vague film of random light particles scattered throughout the universe. The portion of these diffused and scattered light particles which could be captured by a telescope on the earth is infinitesimal to the extreme, and entirely unseeable. It is pure fiction for our scientists to say that when they look into a telescope they are seeing actual objects from the deepest of deep space. The intelligent yet untrained millions like me and you are entirely complicit in this fiction, and it cannot exist without our desire to believe. We want to believe that it is so, so that we will feel like we actually know the meaning of the deep night sky which surrounds us and which seems so mysterious. We want to believe that the mysteries of the ages have been solved, and that we live in a time in history when almost everything is knowable. We want ourselves to be placed at the pinnacle of the evolutionary development of not only the earth but of the whole universe. We want to be the Masters of the Universe. Yet we are not even close to mastering the universe. We are, though, close to mastering the intricacies of our solar system: the sun and the eight (or nine) planets and the asteroids and the comets. All these parts of the solar system are close enough for us to see without being fooled by the optical qualities of light. We’ve actually set foot on the moon, and we’ve sent space probes to land on Mars and to fly by all the planets, and take up-close pictures. We may just have to be satisfied with being masters of our solar system; at least until some thus far unknown technology allows us to extend our physical reach beyond its borders. Nicolai Copernicus (1473-1543) was probably the first master of our solar system. He didn’t even have a telescope, yet he was able to use Euclidian geometry and arithmetic to chart the observations he had made of the night sky. He was able to distinguish the fixed stars from the moveable planets, chart the relations between these two types of lights in the sky, and chart the relationships between these stars, these planets, the earth, the moon and the sun. His conclusion, that the sun is the center of the solar system, has stood the test of time. The science of optics has really not changed much in the last four hundred years. We of course know how to make better optical devices. Yet the principles of diffusion and diffraction, and the principle that a light source which is nearer is usually brighter than a light source farther away, remains constant. It is easy to conclude, then, even following the words of Copernicus, that a light source which is supposedly 13.4 billion light years away would be so dim as to be utterly invisible. Even our greatest telescopes could pick up only a few, if any, scatterings of light from a source even “only” a million light years away. So here is my first entirely facile description of the universe. 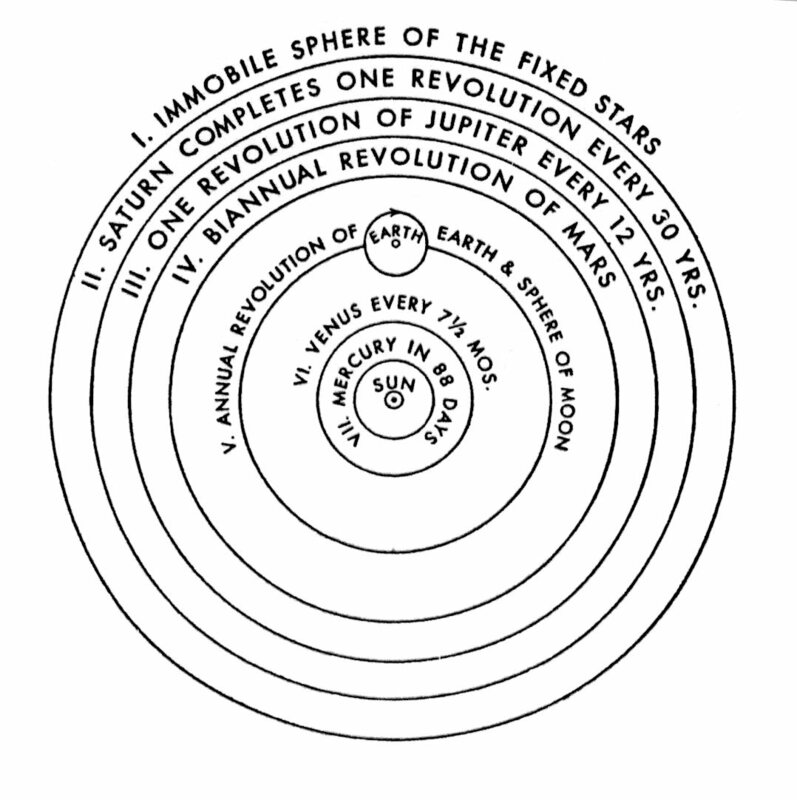 It is just as Copernicus said it was, a shell of fixed stars set at a fixed distance not too far outside of our solar system, and enclosing our solar system as tightly as the orbit of any planet. The lights from these stars cannot really be too far away from us, or else their light would be dimmed, diffused and diffracted to the point of total soupiness. The enclosing darkness and points of light prevent us from seeing anything beyond the orbit of the fixed stars, so there could be either anything or nothing out beyond this orbit. And here is my second entirely facile description of the universe. The universe is a smear of dark matter and dark energy, infused with points of light. Dark matter and dark energy move at far in excess of the speed of light, since by definition they have no light, and thus do not have the limitation of the speed of light; and so cannot be seen by us, a species attuned to the energy and frequency of light only. Our solar system and the points of light we can see are spots in the smear which have become congealed like knots in a pine board, and have thus been reduced to the speed of light, which enables us to see them. In the next parts of this series we will explore the rather unusual relationship between Man and light, and then explore another way of describing the contents of the universe which is perhaps as likely as the current scientific conjectures.